Newsletter #792: The "10 Ways to Make Your Charity Project Go Viral" Issue | Andy Sernovitz | Damn, I Wish I'd Thought of That! 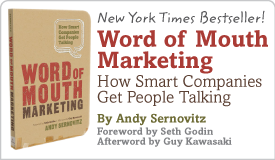 Word of mouth is more than a marketing technique, it’s a powerful way for important messages to spread. We were so amazed by the work of charity: water, we’re making them the official cause of our upcoming Word of Mouth Supergenius event on July 20 in New York. Your URL is how people will share your event online. Big clunky ones make it hard to forward, so keep yours short and simple. Charity: water makes it easy to create your own short, descriptive URL (for example, ours is http://mycharitywater.org/wom). The people organizing events to raise you money are everything — make them feel special. Charity: water helps organizers by giving them their own page to send friends to. When you’re recruiting donors, you’re not sending them to the Red Cross home page, it’s your goal, your name, and your logo. It’s your cause. Make donors feel like rock stars. Let them know how much their contribution means to your cause and let the world know how much they helped. Donors to charity: water get a big thank you message after contributing and their name is added to a scoreboard that includes their own personal message. Your story is your topic — and like all word of mouth topics they should be simple, portable, and repeatable. With charity: water, your goal is tied to specific numbers (10 wells, 10 villages, $20 equals 20 years worth of water, etc.). It makes it easy to talk about and easy to see what a difference even a tiny donation can make. Fewer steps between your donors and their social networks means your cause is more likely to go viral. Charity: water uses simple one-click buttons to share with Twitter, Facebook, and to email friends. Make it easy on your talkers by giving them everything they need to talk about you. Charity: water has videos fans can embed, sample stories, banners, posters, T-shirts, wristbands — everything a talker needs to spread the word. Post your shareable content in ways that talkers are familiar with. Host your videos on Vimeo and YouTube, put your photos on Flickr, and create web banners in standard sizes. Use every opportunity for your cause to piggyback existing events and topics. Charity: water lets you donate your birthday — a naturally social event — to invite friends to contribute to a water project rather than give gifts. Donors to your cause are a likely crowd to start their own fundraising project. After you donate to a charity: water page, you’re immediately offered the chance to start your own fundraiser. In less than two minutes and in about two clicks, someone can go from donor to fundraiser. 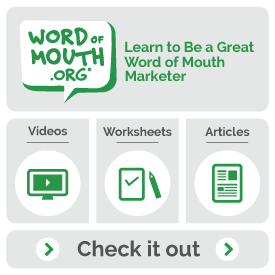 Help us show the world what word of mouth can do. $20 can give one person clean water for 20 years. And every person you tell about our project helps bring a well to some fantastic communities on the other side of the world that really need our help.